This salad is late summer on a plate. Is it late summer? I always assume August is late summer–even though technically September is too, right? Anyway, August makes me think of the end of summer because it’s kind of back-to-school season (school supplies are out in force and I am jealous! GIMME ALL THE PENS, PLEASE) and it’s when the tomatoes seem to be at their best. I intended to make this recipe with peaches, but I got a bunch of mealy ones and it totally bummed me out. Thus, the nectarines. Plus, they have been so good and on sale. WIN/WIN. The tomatoes were from the cute farmer’s market near my neighborhood and every year I always forget how delicious tomatoes can be until summer rolls in and reminds me. So, so delicious and juicy and sweet. I added feta and mint to this salad because I am obsessed with that combo and I really love it with tomatoes and stone fruit. 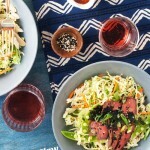 I made a quick and simple shallot vinaigrette to let the fruit shine while adding a definite savory note. This salad ended up being the sleeper hit of the BBQ we had for Casper’s birthday. Literally every last bit was eaten and I was actually hoping for some leftovers, but it worked out because I made it again for the blog and then promptly ate it for lunch and had some with dinner in the same day. It’s good, so make it before all the lush summer produce disappears and we’re all crying over a bunch of gourds at the market. This recipe celebrates late summer's bounty--you can sub peaches in place of nectarines, just use whatever looks best to you! Slice the nectarines and tomatoes into wedges--however thick or thin you like, I like them on the thinner side, like ¼ inch, and arrange on a plate. In a jar with a tight fitting lid, combine the shallots with the vinegar, a pinch of salt, and the honey. Add 2-3 tablespoons of olive oil--you can start with 2 and add another if you like a less sharp dressing. I like it to be pretty tangy and bright, so I go for a 1:1 ratio of vinegar and oil. Shake the dressing, taste, and adjust seasonings to your preference. 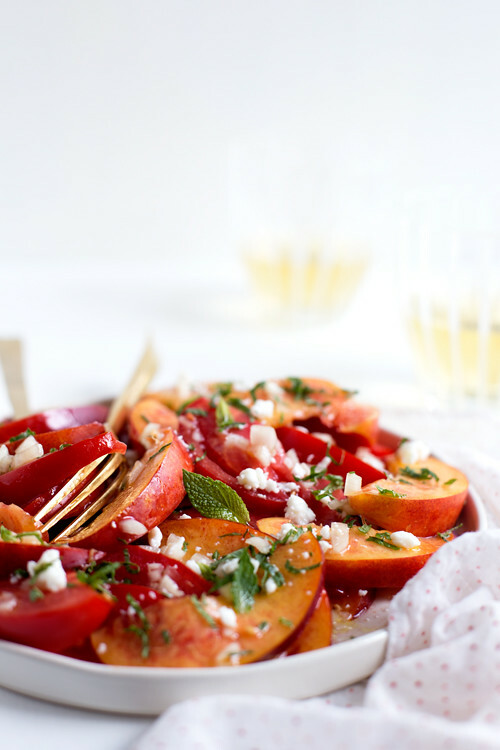 Drizzle the dressing over the nectarines and tomatoes, sprinkle the mint leaves over the top, followed by the feta. Season with salt and pepper to taste. 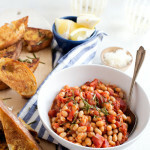 Better On Toast: Zingy White Bean Toasts and A Giveaway! Oh man!! That flavour combination is AWESOME! Mechanical pencils are the bomb. I used to (actually, still am) be obsessed with those stacking ones (http://www.orientaltrading.com/glitter-stacking-point-pencils-a2-9_36.fltr?Ntt=stacking%20pencil) even though they barely worked after you started using them! 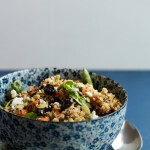 I love the combination of sweet and savoury in this recipe and the creamy feta makes it so summery! I was in love with this as soon as I saw it on Instagram! Feta and mint, together, is my bae (is that weird? Yeah probably). Not weird to me, at all (I’m probably weird). So beautiful! 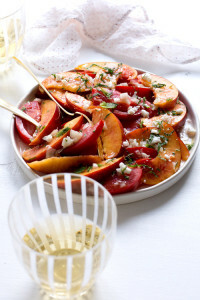 I definitely need to get my hands on some nectarines ASAP. Such a pretty salad, Cindy! I bought some mealy peaches recently, too, and now I’m afraid to buy more. The worst! I’m glad nectarine saved the day. Lol – you definitely make snapchat sound like it’s worth a try. I couldn’t figure it out either. 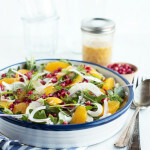 LOVE the colors in this salad – totally gorgeous! Haha, thanks! I don’t know if I do snapchat any justice, but it’s kind of fun! Hi Cindy!! 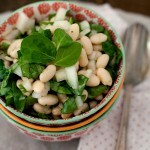 I have made this salad several times, but several times, since you posted it. We had it tonight, again. We love it! 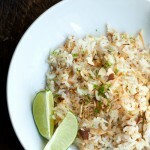 and is simple to make, but has multidimensional levels of flavor. The combination of salty feta with sweet nectarines (or peaches), juicy tomatoes, tangy vinaigrette and refreshing mint makes this salad a regular. I only have a few nectarines left and it makes me sad, summer is over. But looking forward to your other recipes. Thank you! This makes me so happy, Blanca! Thank you for the comment, it made my day!